Not to be confused with Earth, Texas. Erath County (/ˈiːræθ/) is a county located in the U.S. state of Texas. According to the United States Census bureau its population was 41,969 in 2017. The county seat is Stephenville. The county is named for George Bernard Erath, an early surveyor and a soldier at the Battle of San Jacinto. Erath County is included in the Stephenville, Texas, Micropolitan Statistical Area. Erath County is the location of two of North America's largest renewable natural gas plants. The largest is at Huckabay Ridge, near Stephenville. The second largest is located outside Dublin at Rio Leche Estates. On November 4, 2008, Erath County voters elected to allow the sale of beer and wine in the county for off-premises consumption. Caddo tribe Anadarko villages were scattered along Trinity and Brazos Rivers. French explorer Jean-Baptiste Bénard de la Harpe developed camaraderie among the Anadarko in 1719 when he established Fort Saint Louis de los Cadodaquious. The Anadarko became entangled with the French battles with the Spanish and later the Anglos and suffered the consequences, including diseases for which they had no immunity. By 1860, these tribes moved to Oklahoma. Erath County falls into Comancheria and found itself raided by Comanches until their removal to Oklahoma after 1875. 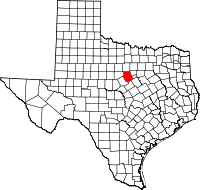 Erath County was formed from Bosque and Coryell counties in 1856 and named for George Bernard Erath, one of the original surveyors of the area. In 1856, John M. Stephen offered to donate land for a townsite which was named Stephenville after him and became the county seat. A. H. Dobkins founded the community of Dublin in 1854. Other early settlers in Dublin were Will and Tom Holland. Dublin later became famous as the early boyhood home of the PGA, U.S. Open and Masters golf champion Ben Hogan. In 1855, thirty pioneers settled in the county, led by the surveyors George Erath and Neil McLennan. Included in the group were brothers William F. and John M. Stephen, and a black family whose name and destiny seems to have been lost to history. Erath (1813–1891), an immigrant from Vienna, Austria, was a Texas Ranger and member of Billingsley’s Company C, 1st Regiment of Texas Volunteers, under the command of Col. Charles Burleson at the Battle of San Jacinto, and a member of the Confederate Home Guard. As a Freemason, he was a charter member and secretary of Bosque Lodge #92, from 1852 to 1855 which changed its name to Waco #92 in 1857 and remains the oldest continuous organization in Waco, Texas. Cotton became the major crop between 1875 and 1915, with the largest crop being in 1906. The industry was helped in 1879 when the Texas Central Railroad reached Dublin, and in 1889 when the Fort Worth and Rio Grande railroad was completed through Stephenville. This opened eastern markets for the county's cotton crops. By 1910, soil erosion and the boll weevil caused diversity planning that led to dairy farms, fruit orchards, nurseries, peanuts, feed crops and poultry. The community of Thurber was created by the Johnson Coal Company. From 1888 to 1921, the Texas Pacific Coal Company mined coal near Thurber, making it a leading coal producer in the state. Fifty-two percent of the miners were of Italian ancestry, creating the "Italian Hill" community just outside Thurber. The United Mine Workers in 1903 sent Joe Fenoglio to organize the Italian workers, thus beginning the Thurber Coal Miners Strike. In the 1970s, the area began bituminous coal production for fuel in the cement industry. Tarleton State University was founded in 1893 as Stephenville College but was renamed in 1899 after the local rancher John Tarleton rescued the institution from financial difficulties. Erath’s original 1866 wooden courthouse burned to the ground, destroying county documents along with it. A second stone courthouse was built in 1877 but eventually razed. The cornerstone for the current courthouse was laid in 1891. The architects James Riely Gordon and D. E. Laub designed the present three-story showcase Victorian structure. In addition to Erath, Gordon designed the Arizona State Capitol, and courthouses in Aransas, Bexar, Brazoria, Comal, Ellis, Fayette, Gonzales, Harrison, Hopkins, Lee, McLennan, Victoria and Wise counties. The building was completed in 1893, with limestone from the Leon River and red sandstone from Pecos County. The building’s centralized 95-foot tower has a bell tower and creates a chandeliered atrium from the first floor to the third. The interior is east Texas pine, with cast and wrought-iron stairways, and tessellated imported marble floors. It was renovated in 1988. According to the U.S. Census Bureau, the county has a total area of 1,090 square miles (2,800 km2), of which 1,083 square miles (2,800 km2) is land and 6.7 square miles (17 km2) (0.6%) is water. At the 2010 census, there were 37,890 people, 14,569 households and 9,003 families residing in the county. The racial makeup of the county was 85.6% White, 1.2% Black or African American, 0.8% Native American, 0.7% Asian, 0.0003% Pacific Islander, 10% from other races, and 1.7% from two or more races. 19.2% of the population were Hispanic or Latino of any race. There were 14,569 households of which 29.59% had children under the age of 18 living with them, 49.03% were married couples living together, 14.7% had a female householder with no husband present and 38.2% were non-families. 27% of all households were made up of individuals. The average household size was 2.47 and the average family size was 3.06. 22.29% of the population were under the age of 18, 19.40% from 18 to 24, 23.10% from 25 to 44, 22.60% from 45 to 64, and 12.60% who were 65 years of age or older. The median age was 30.5 years. For every 100 females there were 96.50 males. Erath County is heavily Republican. In 2012, Mitt Romney won the county in the presidential election, taking over 80% of the vote. The last Democrat to win the county was Jimmy Carter in 1980. Two newspapers have offices located in Erath County: The Stephenville Empire-Tribune and The Dublin Citizen. Local television stations that provide coverage for Erath County and surrounding areas come from the Dallas/Fort Worth and Waco/Temple/Killeen metropolitan areas. Five radio stations have their main studios and offices in Erath County: KEQX 89.5, KTRL 90.5, KSTV-FM 93.1, KXTR-LP 100.7 and KSTV (AM) 1510. KTRL and KXTR-LP are operated by Tarleton State University. ^ a b "State & County QuickFacts". United States Census Bureau. Archived from the original on July 10, 2011. Retrieved December 10, 2013. ^ "Anadarko Indian History". Access Genealogy. Retrieved December 15, 2010. - "Caddo Indian History". Access Genealogy. Retrieved December 15, 2010. ^ Weddle, Robert S (1991). "Cannibal Coast". The French Thorn: Rival Explorers in the Spanish Sea, 1682-1762. TAMU Press. pp. 208–228. ISBN 978-0-89096-480-4. ^ "Texas Indian Lands". R E. Moore and Texarch Associates. Retrieved December 15, 2010. ^ a b Young, Dan M (2010-06-12). "Erath County, Texas". Handbook of Texas Online. Texas State Historical Association. Retrieved December 15, 2010. ^ "Stephenville, Texas". Texas Escapes. Texas Escapes. Retrieved December 15, 2010. ^ "Dublin, Texas". Texas Escapes. Texas Escapes. Retrieved 15 December 2010. ^ "Beh Hogan bio". World Golf Hall of Fame. Archived from the original on June 4, 2011. Retrieved December 15, 2010. ^ Longwell, Evelyn Clark (2010-06-15). "Neil McLennan". Handbook of Texas Online. Texas State Historical Association. Retrieved December 15, 2010. ^ "Officers and Enlisted Men Battle of San Jacinto 21st April 1836". Sons of Dewitt Colony Texas. Archived from the original on December 5, 2010. Retrieved December 15, 2010. ^ "George B. Erath - Texas Mason Honored in Stephenville". The Grand Lodge of Texas Ancient Free and Accepted Masons. Archived from the original on November 23, 2010. Retrieved December 15, 2010. ^ "Thurber, Texas". Texas Escapes. Texas Escapes. Retrieved December 15, 2010. ^ "The Italian Presence in the Coal Camp of Thurber, Texas". Thurber, Texas. Retrieved December 15, 2010. - Taylor, Wilma Rugh (2005). "Finding Surprises in East Texas". Gospel Tracks through Texas: The Mission of Chapel Car Good Will. TAMU Press. pp. 47–56. ISBN 978-1-58544-434-2. ^ Dethloff, Henry C (1996). Texas A&M University: A Pictorial History, 1876-1996, Second Edition. TAMU Press. pp. 62–64. ISBN 978-0-89096-704-1. - Peterson's (2008). Colleges in the South: Compare Colleges in Your Region. Peterson's. p. 194. ISBN 978-0-7689-2695-8. ^ Lurie, Maxine N; Mappen, Marc; Siegel, Michael (2004). Encyclopedia of New Jersey. Rutgers University Press. p. 324. ISBN 978-0-8135-3325-4. ^ Herda, Ed.D., Lou Ann. "Erath County Courthouse". Texas Escapes. Texas Escapes. Retrieved December 15, 2010. ^ a b Leip, Dave. "United States Presidential Election Results". Atlas of US Presidential Elections. Wikimedia Commons has media related to Erath County, Texas. Entry for George B. Erath from the Biographical Encyclopedia of Texas[permanent dead link] published 1880, hosted by the Portal to Texas History.